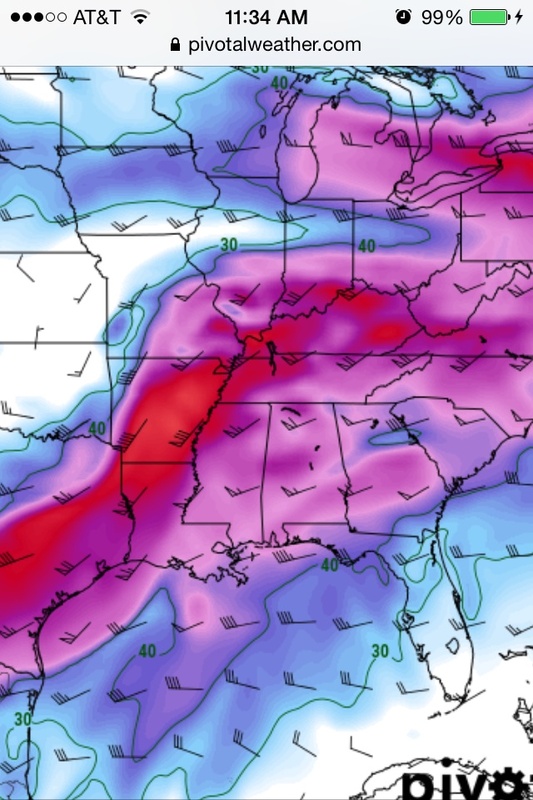 What area’s of the south would be in play for severe taking the EURO at its latest run? I've look at this for 2 hours and other parameters. This is late this afternoon and is a little concerning, especially after this morning little surprise over Marshall County. The much better westerly bulk shear values on Sunday definitely add to an increasing threat for this period. GFS and Canadian are still faster than the Euro because they're not as strong with the Euro and UKMET with the wave to the west going into Friday as it's carving out its trough, BUT they are trending slower a bit and are trending north with the surface low track.... especially compared to last night's runs. They are gradually trending toward the Euro solution. Looking at the GFS, would Memphis see less Severe being that the low is to its south and east at Hr 138 & 144? Nasty wind fields on the soundings in AL on the GFS. This is nasty as well on the bulk shear values. Looks like the 12z UK shifted faster though. We're probably seeing the models attempt to converge on a time. GFS/CMC were once Saturday evening/night event. UKMET was more in line with the Euro which was a Sunday afternoon threat. GFS/CMC has slowed. We'll see what the Euro does, but the UKMET has sped up (and I suspect the Euro will do the same). Either way, nearly all solutions are a severe wx event for Sunday. I count about half of the GEFS members that are 6-9 hours slower than the operational making it a Sunday midday/afternoon threat for Dixie. What kind of spread is there with the low pressure placement? Still some decent spreads in both placement and timing. I'm personally not as confident in honing in on a time yet esp with the Euro having sped up to Sunday morning now and looking a little less impressive across the board than yesterday. Still a ways to go to figure this one out. The Euro is a midday/early afternoon event on Sunday. I think it is safe to say Sunday morning-Sunday afternoon will be a period of rough weather for Dixie. I do not see any model solution that is a nonevent. The next question is the magnitude of severe. This is valid for 1pm Sunday. Many GEFS members still have the trough back to our West. There are many slower members with some amped solutions. Then, there are a few that are faster, weaker, and flatter. And then there are a couple you can toss because, that just is so far off from the rest of guidance. You can definitely see where some of those members hold the low pressure further west such as Member 3, 20 etc. 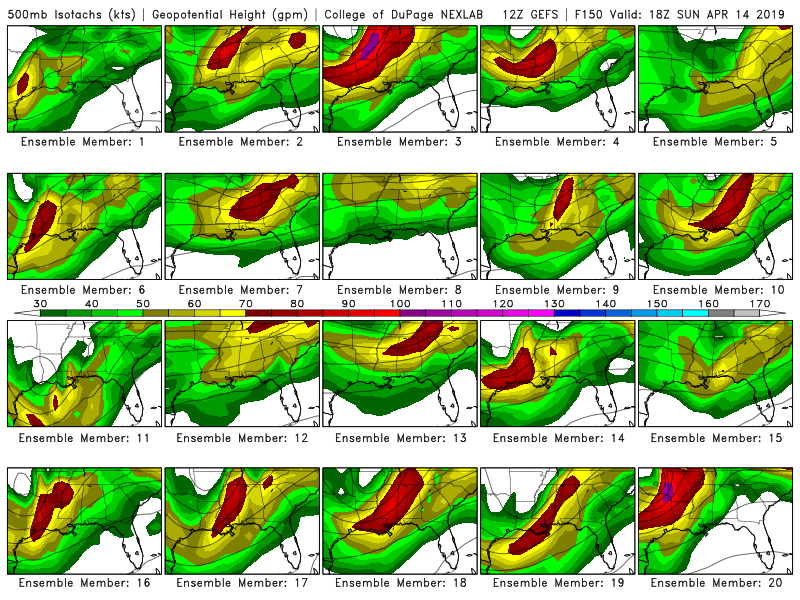 There are some pretty far north and deep SLPs on the Euro ensemble member chart.